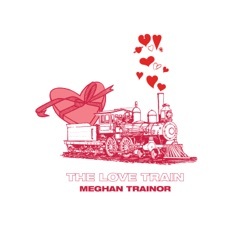 THE LOVE TRAIN is the first EP by Meghan Trainor, released by Epic Records through Sony Music Entertainment on February 8, 2019. It’s fun, romantic, and simplifies feelings that humans can tend to have a habit of over-complicating. All and all, the production on these tracks are fantastic and will hold us over until Trainor's next studio album is released. ‘The Love Train’ comes just in time for Valentines Day and serves as a collection of romantic songs that will have your heart skipping a beat. Overflowing with lush production and endearing sentiment, The Love Train makes me more excited to hear what is in store for us on Treat Myself. Say goodbye to your brief career Treat Yourself will never come out. The preview tracks were converted to "singles" and this is the rest. No wonder the record company rejected it. There are absolutely no singles that struck a nerve with the public. Nothing on this EP will either. Her music went from catchy to "bleaugh"
Nah to the ahh to the no no no What the hell is going on? Treat Myself released date pushed back. Then pulled all together, with all of the songs changed to singles. Then this hot mess. The best song is All The Ways, which was already on Treat Myself. Whatever.